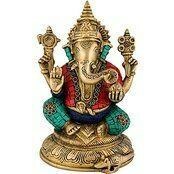 Beautiful Handwork Brass Ganesha Staute. The statue has gorgeous Colorful Stone Inlay Work. The quality & Original product. Lord Ganesha represents Joy and happiness which is symbolic to bring Prosperity and Good Luck. Look at his round tubby and snack around it which represents son of Lord Shiva. FREE EXPRESS SHIPPING..LIMITED OFFER In his upper right hand Ganesha holds a goad, which helps him propel mankind forward on the eternal path and remove obstacles from the way. The noose in Ganesha's left hand is a gentle implement to capture all difficulties. The broken tusk that Ganesha holds like a pen in his lower right hand is a symbol of sacrifice, which he broke for writing the Mahabharata. The rosary in his other hand suggests that the pursuit of knowledge should be continuous. The laddoo (sweet) he holds in his trunk indicates that one must discover the sweetness of the Atman. He is the Lord of success and destroyer of evils and obstacles. He is also worshipped as the god of education, knowledge, wisdom and wealth. In fact, Ganesha is one of the five prime Hindu deities (Brahma, Vishnu, Shiva and Durga being the other four) whose idolatry is glorified as the panchayatana puja. About Ganesha: Ganesha the elephant-deity riding a mouse has become one of the commonest mnemonics for anything associated with Hinduism. This not only suggests the importance of Ganesha, but also shows how popular and pervasive this deity is in the minds of the masses. Product Specifications: Size : 7 Inches Heigh, Weight : 2.2 KG (Heavy) Total Shipment Weight : 4 KG Material : Solid brass with Inlay Work.